The ILT arises as a single trunk or a collection of vessels from the lateral aspect of the cavernous carotid artery region. It usually supplies adjacent dura and cranial nerves and has extensive anastomoses with the extracranial circulation, particular branches of the IMAX and middle meningeal artery as well as ophthalmic artery. 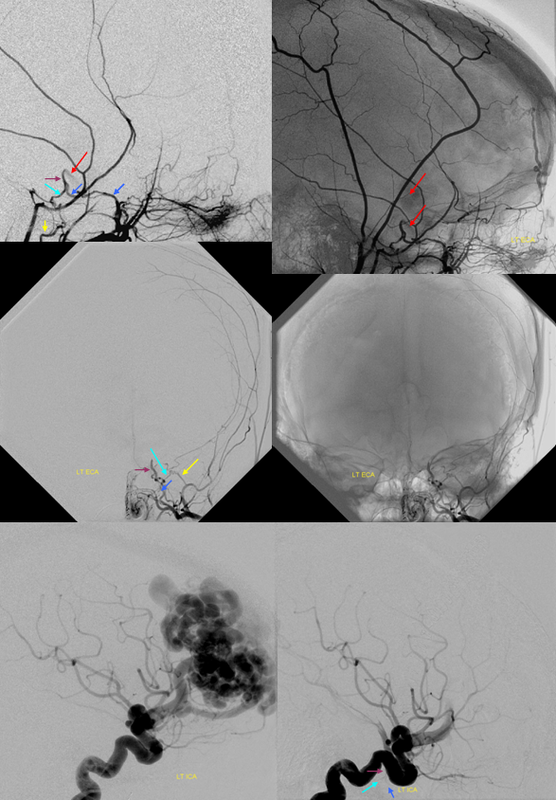 It is a remnant of the primitive dorsal ophthalmic artery. 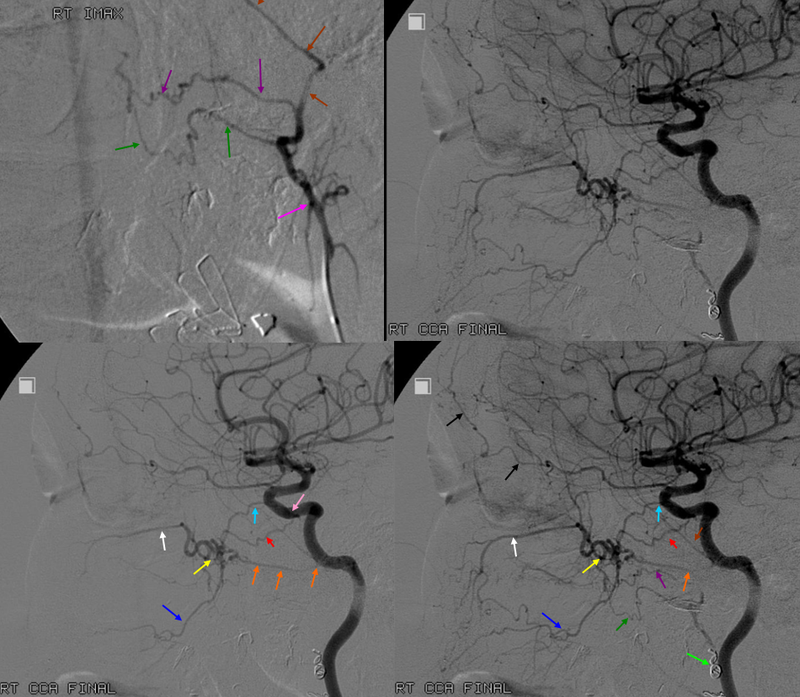 The ILT and adult ophthalmic arteries are primary routes of ICA reconstitution following proximal ICA occlusion. The importance of understanding ECA-ICA collaterals of the ILT is paramount. B) Recurrent branch of the ILT — courses along CN IV, and collateralizes with branches of the MHT. 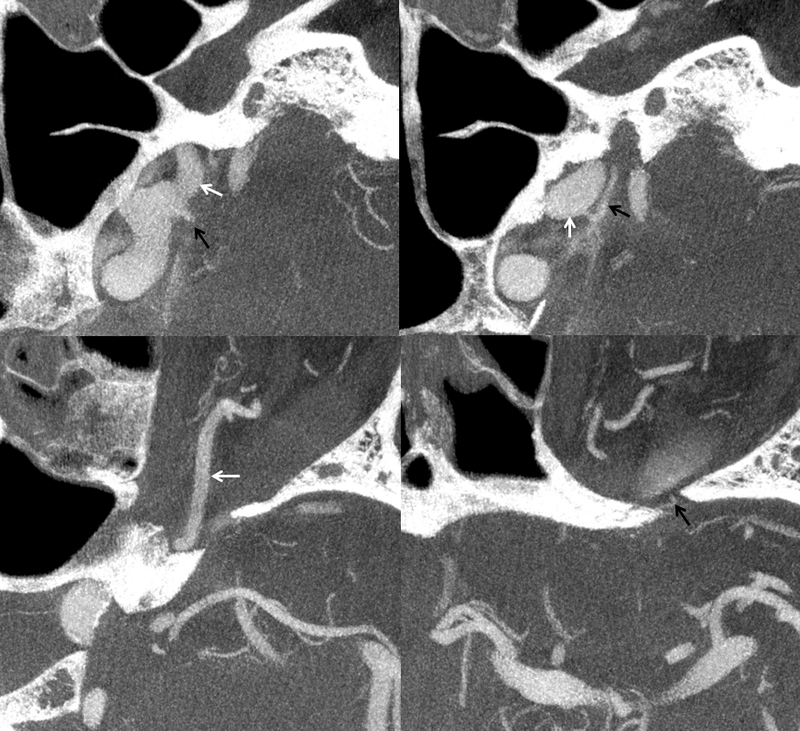 Not rarely it annexes the territory of marginal tentorial (G) or lateral tentorial (F) arteries which more commonly come off the ILT (see ILT). E) Foramen ovale branch — yet another important branch which supplies the appropriate foramen ovale nerve and collateralizes with the accessory meningeal artery (J) and also with carotid branch of the ascending pharyngeal artery (H) coming up through foramen ovale and cavernous branch (I) of the middle meningeal artery. 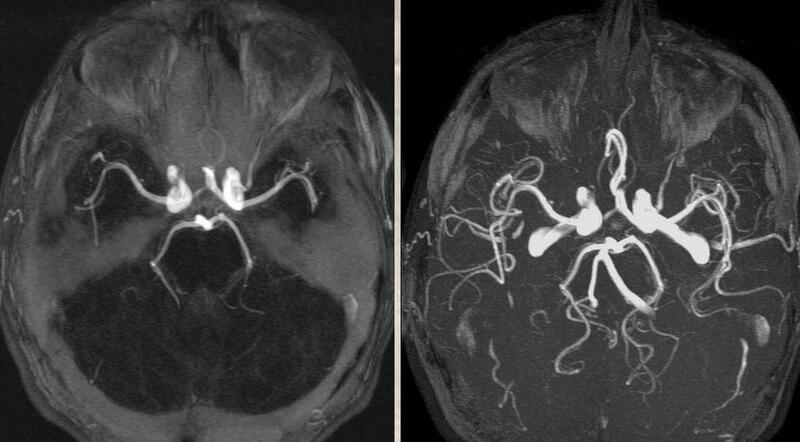 The checkered vessel anastomosing with the basilar artery (N) is the trigeminal artery, which sometimes originates from the region of the ILT. 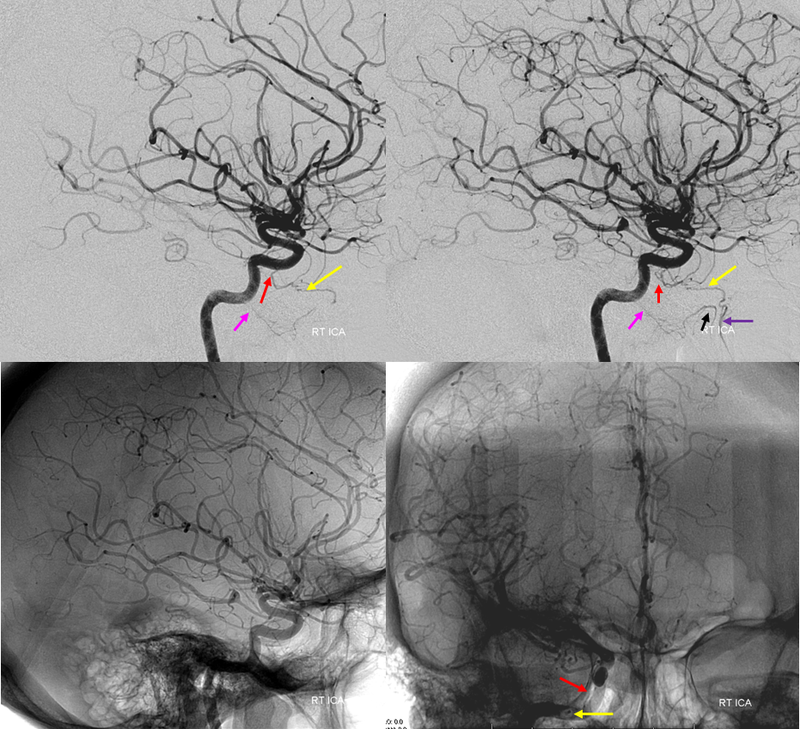 In this patient, a normally prominent ILT (red) gives rise to the artery of the foramen rotundum (yellow), which supplies the roof of the nasopharynx, in combination with the also somewhat prominent Mandibulovidian Artery (pink) taking over the territory of the ascending pharyngeal in supply of the posterolateral nasopharynx (black). 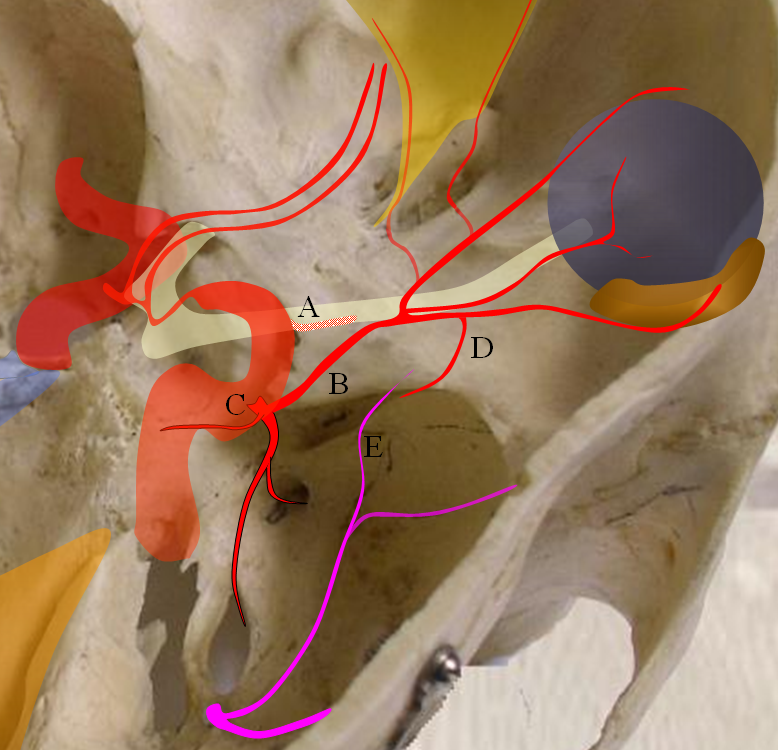 Notice the “down the barrel” view of the foramen rotundum artery within the foramen rotundum on the frontal native view (lower right). The ILT, along with the ophthalmic artery, is a primary pathway of ICA reconstitution following proximal occlusion. Common routes include foramen rotundum branch, accessory and cavernous branches of the accessory and middle meningeal arteries. 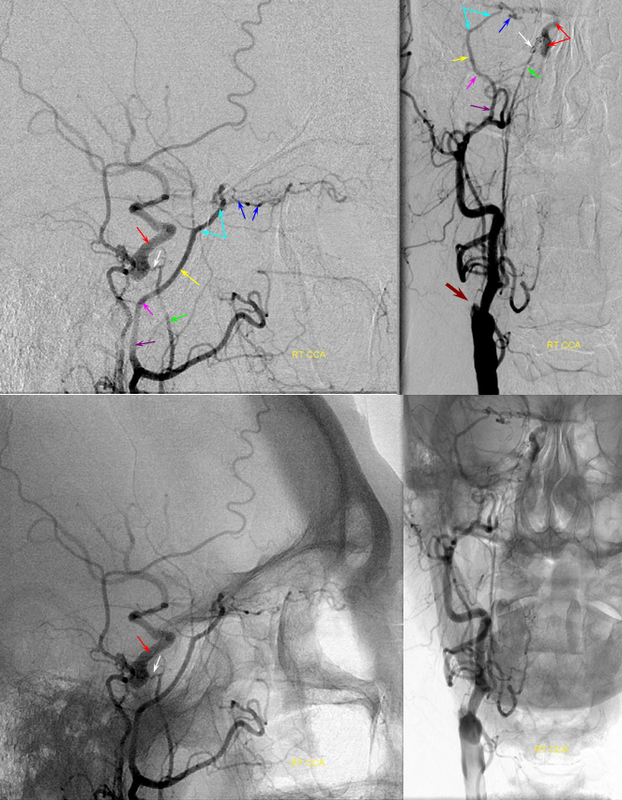 Accessory meningeal reconstitution of the MCA territory via foramen ovale branch — right ICA is occluded at the origin. The ACOM is insufficient. 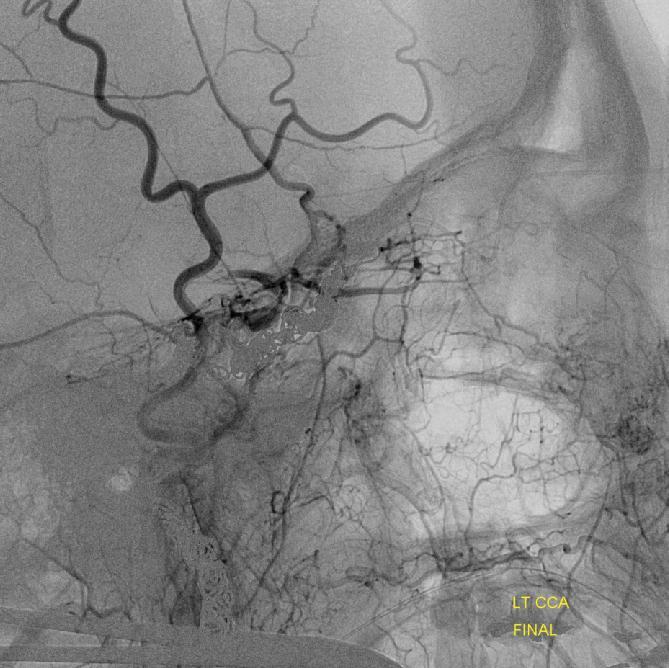 Brisk reconstitution of the MCA territory is afforded via a the accessory meningeal artery inflow via the foramen ovale branches. 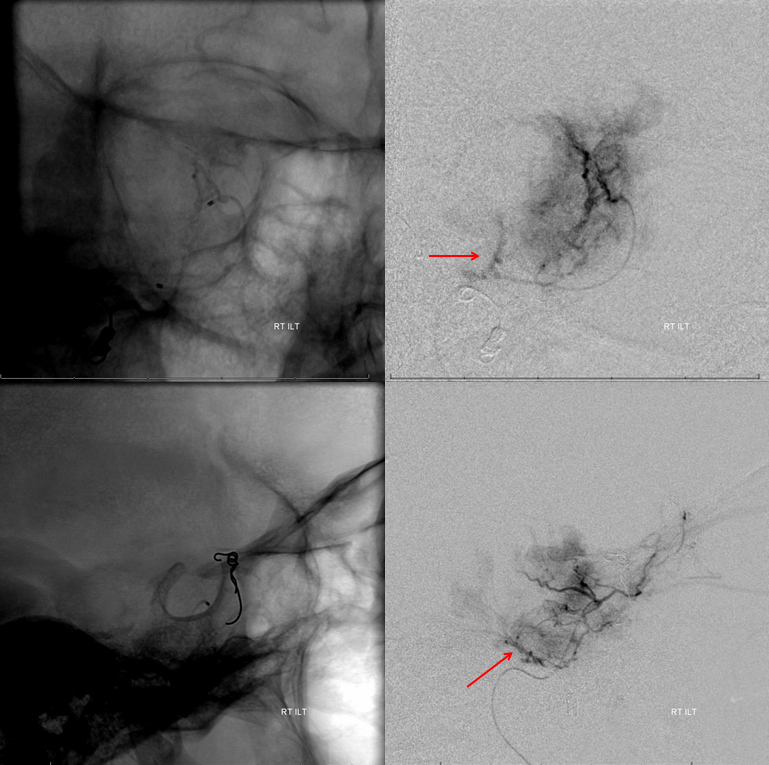 Additional supply to the cavernous carotid was present via posterior clival branches of the MHT (see MHT). The orbital region is being reconstituted via the MMA. 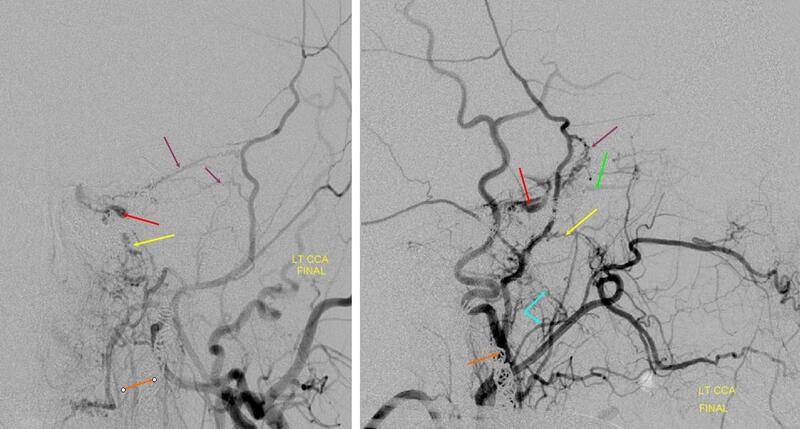 ILT flow reversal into ICA to support AVM. 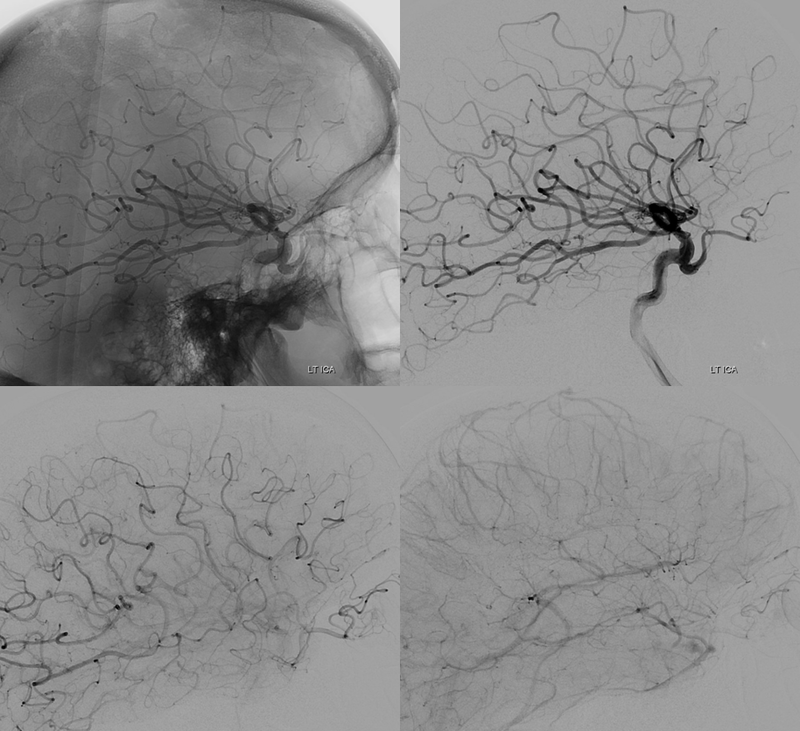 Lateral and AP projections demonstrating prominent supply of ILT via accessory meningeal and foramen rotundum branches. 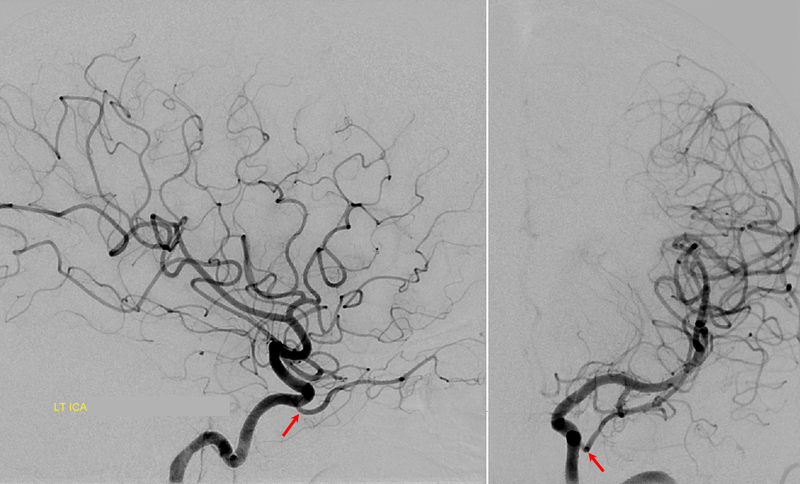 The ILT flow is revesed due to presence of a large right frontal AVM. 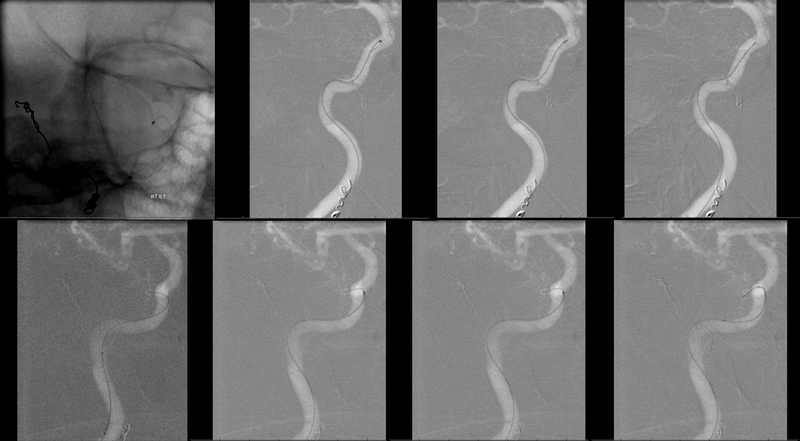 Following embolization (lower right lateral ICA injection), the ILT is now visible off the ICA with normal antegrade flow. Red=ICA. Purple=ILT. Dark Blue= rotundum. Light blue=foramen ovale branch to the accessory meningeal artery. Yellow=accessory meningeal. 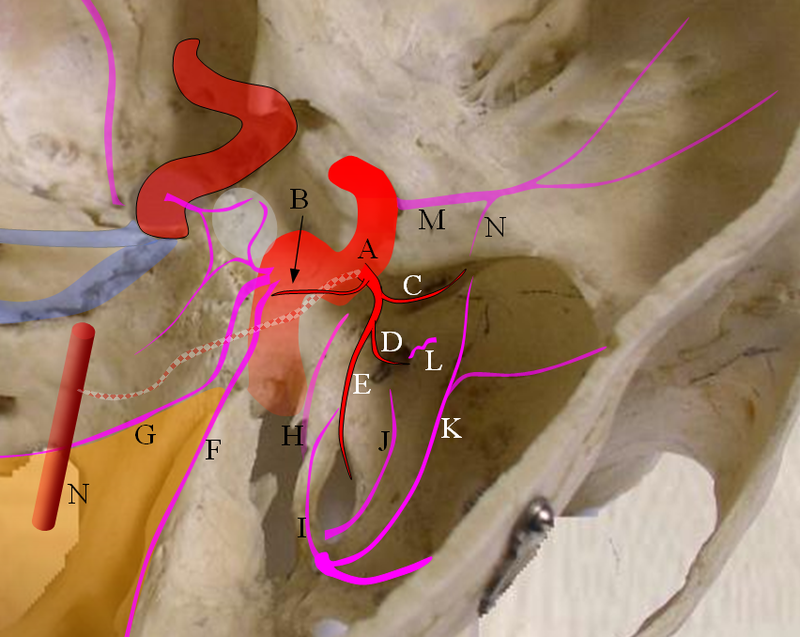 A vessel originates from the lateral cavernous portion of the left carotid artery corresponding to location of the ILT and enters the orbit (red arrows). 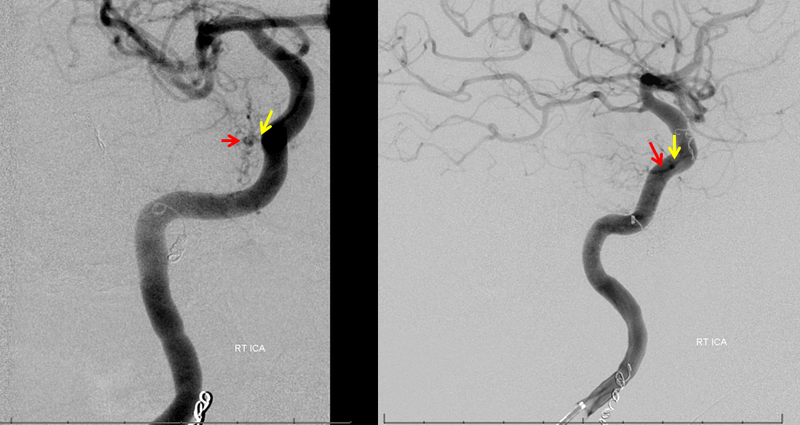 The right ophthalmic artery origin (yellow) is normal. Average (left) and MIP (right) projections of the same case are seen below. Left ICA injection shows a very large dorsal ophthalmic artery — embryologically this is the same as the anteromedial branch of the ILT. Foramen rotundum branch and other branches are commonly recruited for IMAX reconstitution of ICA in setting of proximal occlusion. The reverse may also take place following occlusion of the proximal IMAX, whereby the ILT feeds into the terminal IMAX in the pterygopalatine fossa. Typically, the facial artery is a much more robust candidate for reconstitution, so for ILT to become recruited the facial artery usually must be MIA as well. This is the case here, as the patient has had multiple surgeries for mandibular malocclusion and other issues. 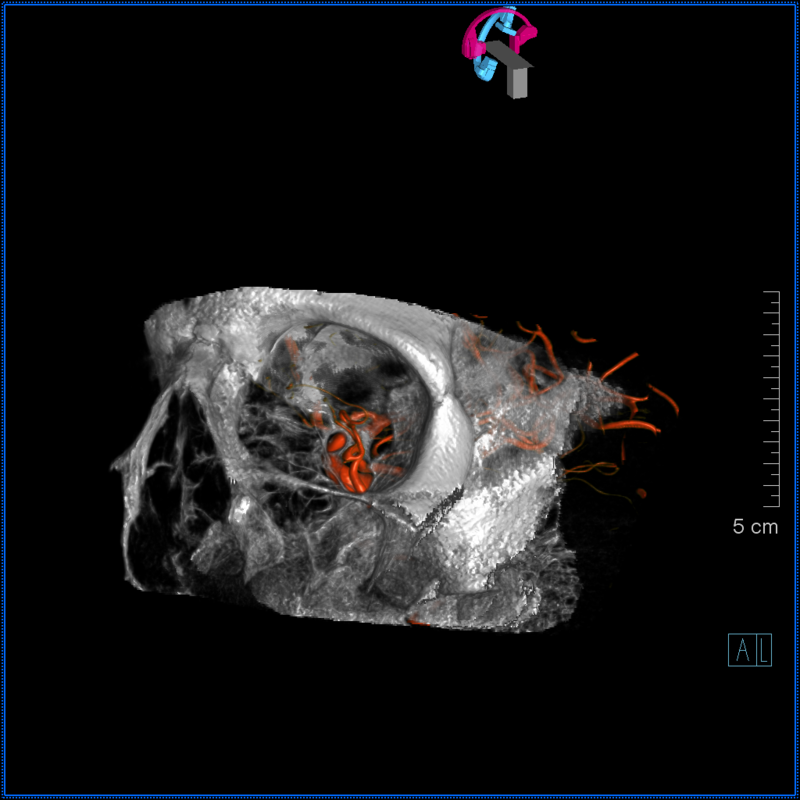 The upper left ECA injection demonstrates occlusion of the distal ECA trunk (pink) with reconstitution of the distal IMAX via two collateral branches (dark green and purple). 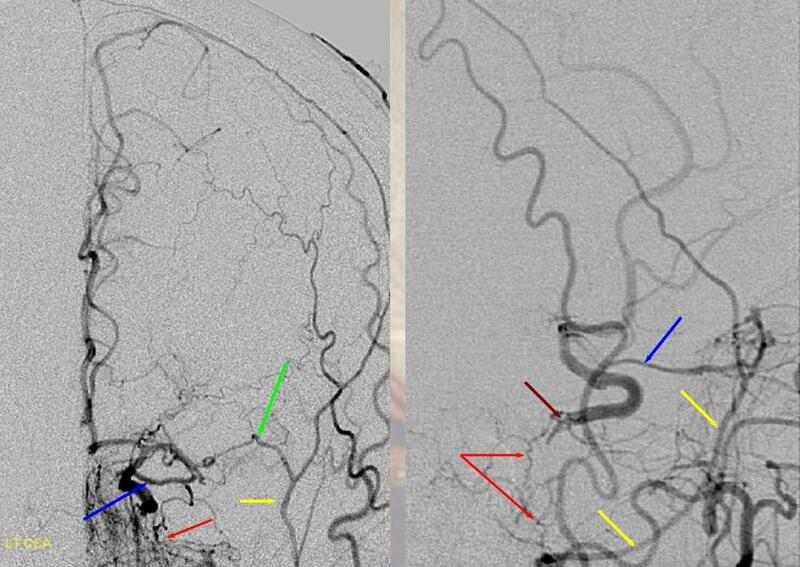 The earlier (bottom left) and later (bottom right) images status post coiling of the ECA (bright green) demonstrate robust reconstitution of the pterygopalatine fossa IMAX (yellow) via foramen rotundum (light blue) and foramen ovale (red) branches of ILT (cream), as well as from the mandibulovidian artery (orange). The sphenopalatine (white) and descending palatine (blue) branches of the IMAX supply the palate and nasal mucosa and extend quite anteriorly on the later phase image. 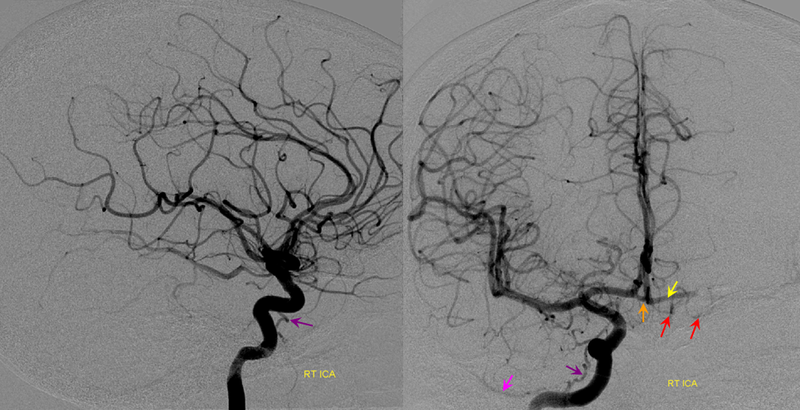 Also note reconstitution of the Middle Meningeal Artery (brown) via retrograde flow thru the above-mentioned IMAX channels (purple and dark green) into the ECA above the coils (pink). 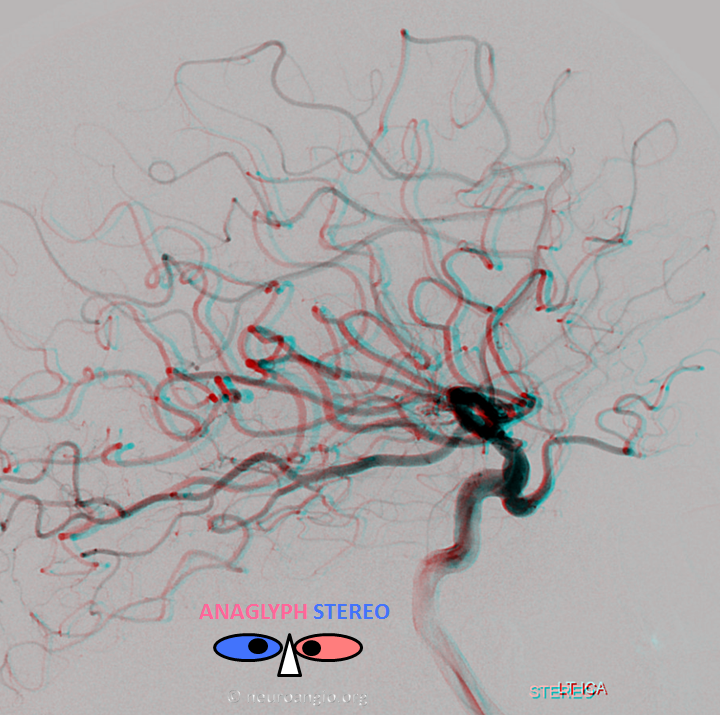 Incidentally noted is presence of a prominent anterior meningeal artery (black) arising from the ophthalmic artery.